Senate Republicans have produced their Obamacare repeal legislation, though as I noted at the end of this interview, it’s really more a bill about Medicaid reform than Obamacare repeal. While it’s disappointing that big parts of Obamacare are left in place, it’s definitely true that Medicaid desperately needs reform, ideally by shifting the program to the states, thus replicating the success of welfare reform. But critics are savaging this idea, implying that “deep cuts” will hurt the quality of care. Indeed, some of them are even engaging in poisonous rhetoric about people dying because of cutbacks. There’s one small problem with the argument, however. Nobody is proposing to cut Medicaid. Republicans are merely proposing to limit annual spending increases. Yet this counts as a “cut” in the upside-down world of Washington budgeting. The Washington Post contributes to innumeracy with a column explicitly designed to argue that the program is being cut. 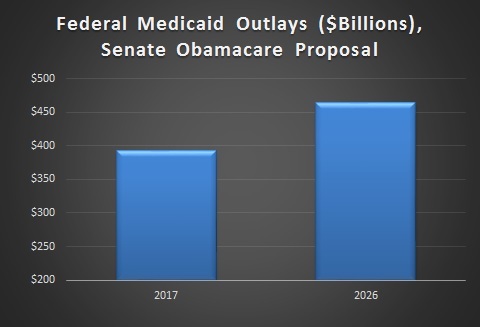 …the Senate proposal includes significant cuts to Medicaid spending…the Senate bill is more reliant on Medicaid cuts than even the House bill… spending on the program would decline in 2026 by 26 percent…That’s a decrease of over $770 billion on Medicaid over the next 10 years. 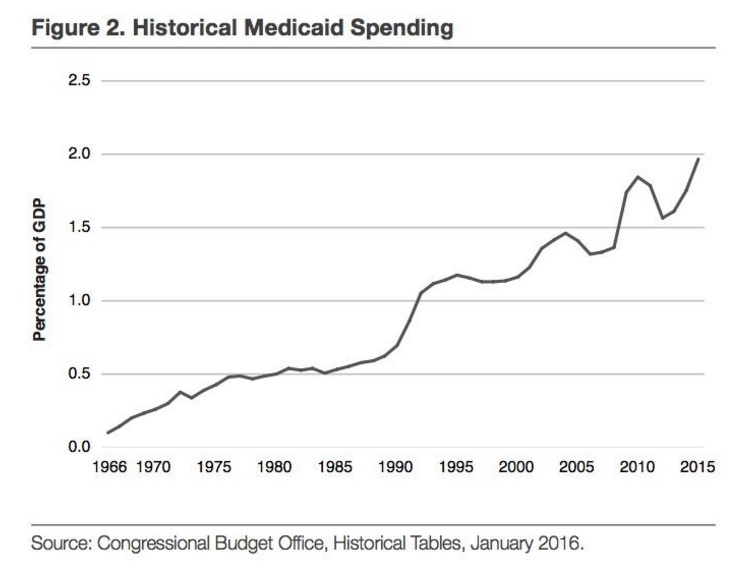 …By 2026, the federal government would cut 1 of every 4 dollars it spends on Medicaid. An article in the New York Times has a remarkably inaccurate headline, which presumably isn’t the fault of reporters. Though the story has its share of dishonest rhetoric, especially in the first few paragraphs. Senate Republicans…took a major step…, unveiling a bill to make deep cuts in Medicaid… The Senate measure…would also slice billions of dollars from Medicaid, a program that serves one in five Americans… The Senate bill would also cap overall federal spending on Medicaid: States would receive a per-beneficiary allotment of money. …State officials and health policy experts predict that many people would be dropped from Medicaid because states would not fill the fiscal hole left by the loss of federal money. I’d like to lose some money using that math. Here’s a chart showing the truth. The data come directly from the Congressional Budget Office. At the risk of pointing out the obvious, it’s not a cut if spending rises from $393 billion to $464 billion. Federal outlays on the program will climb by about 2 percent annually. By the way, it’s perfectly fair for opponents to say that they want the program to grow faster in order to achieve different goals. But they should be honest with numbers. Now that we’ve addressed math, let’s close with a bit of policy. The Wall Street Journal recently opined on the important goal of giving state policymakers the power and responsibility to manage the program. The bottom line is that recent waivers have been highly successful. …center-right and even liberal states have spent more than a decade improving a program originally meant for poor women and children and the disabled. Even as ObamaCare changed Medicaid and exploded enrollment, these reforms are working… The modern era of Medicaid reform began in 2007, when Governor Mitch Daniels signed the Healthy Indiana Plan that introduced consumer-directed insurance options, including Health Savings Accounts (HSAs). Two years later, Rhode Island Governor Donald Carcieri applied for a Medicaid block grant that gives states a fixed sum of money in return for Washington’s regulatory forbearance. Both programs were designed to improve the incentives to manage costs and increase upward mobility so fewer people need Medicaid. Over the first three years, the Rhode Island waiver saved some $100 million in local funds and overall spending fell about $3 billion below the $12 billion cap. The fixed federal spending limit encouraged the state to innovate, such as reducing hospital admissions for chronic diseases or transitioning the frail elderly to community care from nursing homes. The waiver has continued to pay dividends under Democratic Governor Gina Raimondo. …This reform honor roll could continue: the 21 states that have moved more than 75% of all beneficiaries to managed care, Colorado’s pediatric “medical homes” program, Texas’s Medicaid waiver to devolve control to localities from the Austin bureaucracy. By contrast, the current system is not successful. It doesn’t even generate better health, notwithstanding hundreds of billions of dollars of annual spending. Avik Roy explained this perverse result in Forbes back in 2013. Piles of studies have shown that people on Medicaid have health outcomes that are no better, and often worse, than those with no insurance at all. …authors of the Oregon study published their updated, two-year results, finding that Medicaid “generated no significant improvement in measured physical health outcomes.” The result calls into question the $450 billion a year we spend on Medicaid… And all of that, despite the fact that the study had many biasing factors working in Medicaid’s favor: most notably, the fact that Oregon’s Medicaid program pays doctors better; and also that the Medicaid enrollees were sicker, and therefore more likely to benefit from medical care than the control arm. In other words, I was understating things when I wrote above that there was “one small problem” with the left’s assertion about Medicaid cuts hurting people. Yes, the fact that there are no actual cuts is a problem with that argument. But the second problem with the left’s argument is that Medicaid doesn’t seem to have any effect on health outcomes. So if Republicans actually did cut the program, it’s unclear how anybody would suffer (other than the fraudsters who bilk the program). Welcome to the next Venezuela (inflation 40,000% /yr) Argentina, Brazil. I hope I’m wrong, but the unstoppable greed of politicians to get votes from the unproductive by offering freebees will accelerate, till the golden goose called capitalism, is strangulated further by a parasite called socialism. Bye Bye America. Obviously, someone with cancer is more likely to benefit from care than someone without cancer. But, the leap is made to say that even with care the “measured physical outcome” was no better than the person without cancer. Take this with a grain of salt, because I’m not really sure, but couldn’t the actual effect be the opposite of what you suggest? I agree that the people who self-selected into Medicaid probably had worse health. But then they would theoretically benefit more from Medicaid than the healthier people who stayed out of Medicaid. That is, the Medicaid group should have been able to show more improvement in (for example) blood pressure because A) they started at a worse level, and B) they had greater access to medical advice. To be clear, the Oregon study measured success as improved blood pressure, blood sugar, and so on. They didn’t measure heart attacks, or hospital visits, or deaths. Those things might line up better with what you suggest. I don’t know if the study proves anything, but if anything it seems to make more of a case that Medicaid doesn’t help health outcomes. While I agree with most of the article, the statement that those on Medicaid have no better outcomes than those without healthcare doesn’t prove anything. Those on Medicaid have a far higher chance of having poor health, relative to those that self select not to pay for health care. You are then measuring outcomes of an unhealthy group against a healthy group. The expectation should be that the unhealthy group will have worse health outcomes than the healthy group, regardless of treatment.